Volkswagens Uber Amarok was first unveiled to the general public in Argentina on December 2009. Since that time the truck has been used as a support vehicle in the 2010 Dakar rally, performing beautifully. The Amarok received four stars from the ENCAP in 2010 for its crash test performance, and five stars from the ANCAP in 2011. Powered by a 2.0L TDI common rail diesel engine, and FSI petrol engine, the Amarok has plenty of power and range. The Amarok gets an estimated 31 mpg when driven on the rear wheel drive variant. The Amarok comes in either single or dual cab, combined with either rear-wheel drive or 4motion four-wheel drive. The engine in its entry level version produces 121 hp with 250 lbs-ft from 2000rpm. It is designed for more torque but less power. As of 2012, there have been additional upgrades including, but not limited to an 8-speed ZF engineered automatic transmission. The Amarok is being built in Argentina, but will not be sold in all major markets, at least not yet. Our neighbors to the south Mexico will sell the Amarok and rumors are that Canada and the U.S. are negotiating to sell the vehicle in their respective countries. In the U.S. only 1% of vehicles have diesel engines, which makes it less attractive for Volkswagen to commit to this market. The interior is similar to the GTI with its folding bucket seats, sport steering wheel, and wide center console. It also boasts leather seats and the interior trim is brushed aluminum. The instrument panel includes a gauge to clock your 0-60 time. There is also an 8-inch touch screen display for your audio system controls that includes cooled direct-mode amplifiers and a 500-watt subwoofer. Critics claim that the 2.0L engine just does not have enough power for a vehicle this size. The consensus is that a more powerful 3.0L V6 diesel engine would serve the Amarok much better. Whatever side of the fence you are on, you would have to agree that the Amarok is a wonderful piece of design and style. 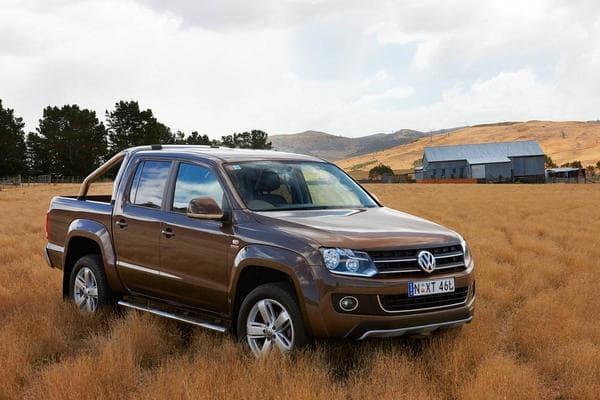 The Amarok will a hit worldwide and another feather in the cap of Volkswagen.